Mast-Roth Farms has planted 30 acres of hazelnuts annually for the past six years. Gerald Mast, left, and Jerry Roth walk a new hazelnut orchard. Mast-Roth Farms near Molalla, Ore., has planted about 30 acres of hazelnut trees a year for the past six years as they transition from Christmas trees. When the last Christmas tree falls, Gerald Mast and Jerry Roth of Mast-Roth Farms hope their young hazelnut orchards will pick up the slack. 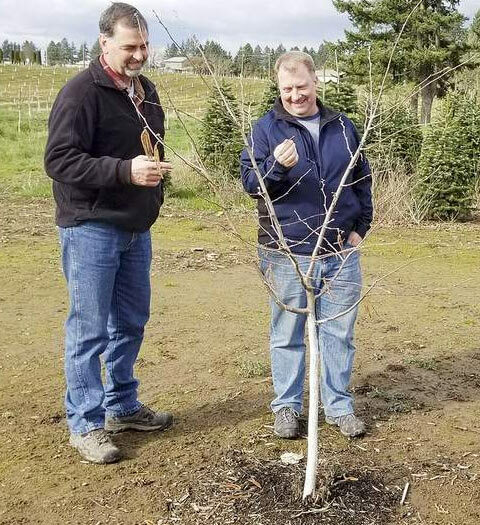 Five years ago, after a glut in the market, the Monitor-Molalla area farmers stopped planting Christmas trees and started putting in hazelnut trees. Mast’s father-in-law, Don Roth, began planting Christmas trees about 40 years ago and Mast joined him five years later. Since then Roth’s son Jerry came in and the two now run the farm. “Labor was also one of the biggest factors for the change; we can do the hazelnuts with just a few people,” Gerald Mast said. The farm is down to 20-30 acres of Christmas trees from its peak of 400 acres. They’re nearly finished planting hazelnuts. They’re in their sixth year of planting about 30 acres a year and hope to end up with about 185 acres in nuts. Two years ago, they began harvesting nuts from 4-year-old trees and this past year harvested from 4- and 5-year-old trees. It was a low production year for everybody, but Mast and Roth were pleased at their yield, gathering 600 pounds per acre on the 4-year-old trees and a little more than 1,500 pounds on the 5-year-olds. Selling off some of their Christmas tree equipment has helped them in purchasing a whole new set of machinery for their new crop. Along the way, they’ve had a lot of help. They follow the program set out by Valley Ag, a division of Wilco, and Wilbur-Ellis provides recommendations. Lately, some growers have been double-planting for higher, earlier production. Trees go in 10-by-20 feet apart and then when they start to grow together every other tree is taken out and the remaining trees end up 20-by-20 feet apart. “We’re going 18-by-12 because we figure we can get a few more years off the trees before we need to take them out,” Mast said. While the Willamette Valley produces about 99 percent of the U.S. supply, it only produces 4-5 percent of the world’s hazelnuts. In addition to the unpredictable market and labor costs associated with Christmas trees, Mast is just ready to stop.